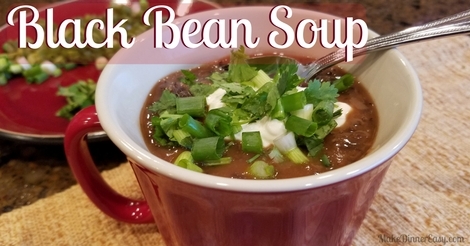 If you're looking for a super quick recipe, this black bean soup recipe won't be what you're looking for. While this recipe doesn't take much work, it does require planning as the beans have to be soaked. It also requires time for the beans to cook. I do like to make this on a cold, rainy day when I am going to be home and want something simmering on the stove all day. I also feel good serving my family this healthy, fiber filled dish. I think they like eating the soup because I put out fun toppings for them to place on top! 1. Soak beans, covered in water, for at least 4 hours or overnight. Drain off water. 2. 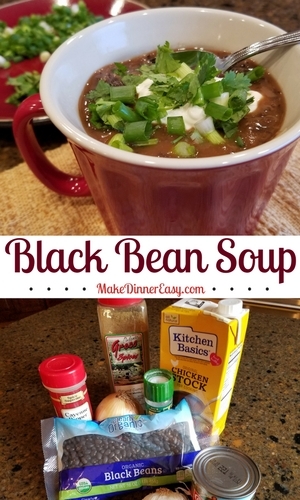 In a large stock pot, place beans, 1 diced onion, 4 minced garlic cloves, chicken broth and salt. Bring to a boil and reduce heat to a simmer. Cook covered for 1.5 hours, stirring occasionally. 3. Cook cooked beans and then place in a blender with tomato sauce. 4. Using the same stock pot that was used to cook the beans, heat olive oil and sauté the remaining onion and garlic. Add blended bean and tomato mixture. Add cumin and cayenne and taste. Adjust seasoning to desired level.